Mahmoud Abbas, the president of the Palestinian Authority, met with leaders of the liberal advocacy group J Street, and thanked them for their lobbying efforts, citing his "appreciation for their efforts to support the peace process within American society." Abbas praised J Street for their involvement in garnering congressional support for a letter sent to the White House, the Times of Israel reported. One hundred and twelve Democrats in the House of Representatives and 34 senators signed a letter sent to the White House calling to reverse the decision "end vital United States contributions to the United National Relief [and] Works Agency (UNRWA)." In August, the Trump administration announced they would be cutting more than $300 million in aid to the UNRWA, which has supported Palestinian refugees. The State Department said that the United States "will no longer commit further funding to this irredeemably flawed operation." In their statement about withdrawing aid, the State Department criticized the fact that the United States contributed over 30 percent of the agency's funds, saying, "We made it clear that the United States was no longer willing to shoulder the very disproportionate share of the burden of UNRWA’s costs that we had assumed for many years." Following this announcement, a spokesman for Abbas said, "The consecutive American decisions represent a flagrant assault against the Palestinian people and a defiance of U.N. resolutions. Such a punishment will not succeed to change the fact that the United States no longer has a role in the region and that it is not a part of the solution." 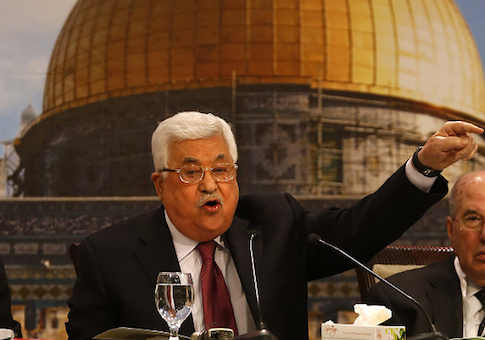 In his meeting with J Street leadership on Wednesday, Abbas continued to criticize the Trump administration, saying "We distinguish between America and the current American administration that has brought the peace process to a dead end." The delegation from J Street, which included their executive director Jeremy Ben Ami, said that they have "affirmed their readiness to continue efforts to resume the peace process on the basis of a two-state solution." This entry was posted in National Security and tagged J Street, Mahmoud Abbas, Palestinian Authority. Bookmark the permalink.